Pirate’s Cove opened earlier this year and is nestled at the end corner of the Lakewood Shopping Center off San Jose Blvd and University. The restaurant invited us to try their menu in this new location. Pirate’s Cove is locally owned and operated and this makes the third location for the family run business of over 22 years. The other two locations are called Seafood Express & More located in the Northside and Southside. The menu is the same at all three locations, but Pirate’s Cove brings a pirate theme to the area. The wait staff were very friendly, offered multiple suggestions when our eyes glazed over the large menu and checked in on all the tables frequently. There are about 20 booths that lead to the counter where orders are placed. Food is delivered to the table and comes out hot and quick. The menu is extensive and includes beer and wine. If you’re looking for a family-friendly seafood place with options, this might just be it. You can order a mirage of seafood prepared fried, blackened, broiled or grilled, chicken or steak. You will also find senior pricing which averaged a few dollars off per item and generous portions throughout the menu. Pirate’s Cove, along with Seafood Express & More, offers remarkable value and there are a few can’t miss menu items that wowed us. If you like a little variety on your plate, there are a few dishes that have multiple appetizers and seafood options. 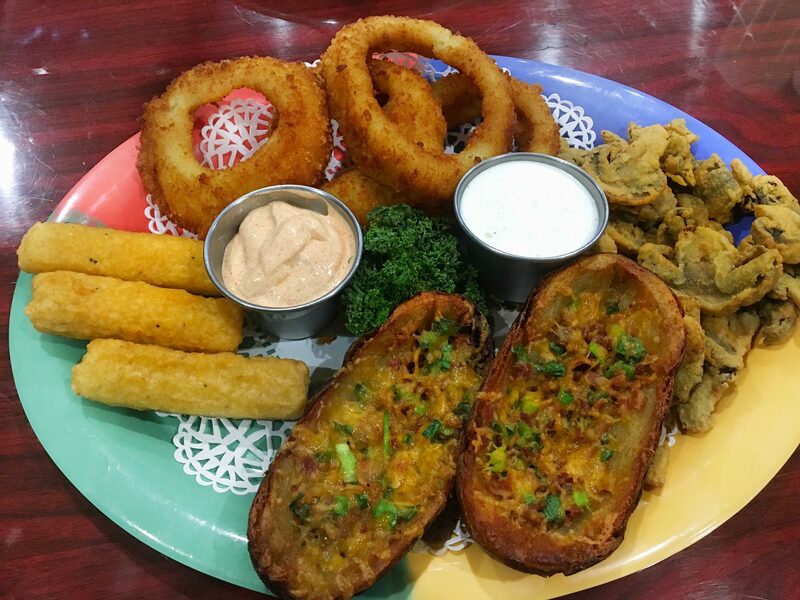 We tried the Express Sampler ($9.95) which came with mozzarella sticks, fried mushrooms, onion rings and loaded potato skins. The fried mushrooms were a table pleaser – light and crispy on the breading and not greasy at all. They were great to dip in the “express sauce.” All sauces are made in house. The potato skins were thick and cooked throughout but didn’t have much flavor despite the cheese, bacon and chives on top. The onion rings were traditional thick slices of onion with a crispy breading which paired well with the dipping sauce. Next up was the house made Seafood Gumbo Bowl ($5.95). You can order this by the cup, but don’t. The bowl is the way to go – it’s that good. This gumbo was perfectly balanced with a little kick and served hot. If you’re a Thai spice 2 person, this gumbo is for you. Thick chunks of seafood filled the bowl and the two hush puppies it is served with make for a great dunker. The hush puppies are probably one of the best hush puppies I’ve had in town – a thin, crunchy outside yet soft and moist inside packed with flavor. For dinner, we ordered the seafood trio ($16.95) and shrimp dinner ($13.95). Both came with two sides and hush puppies. 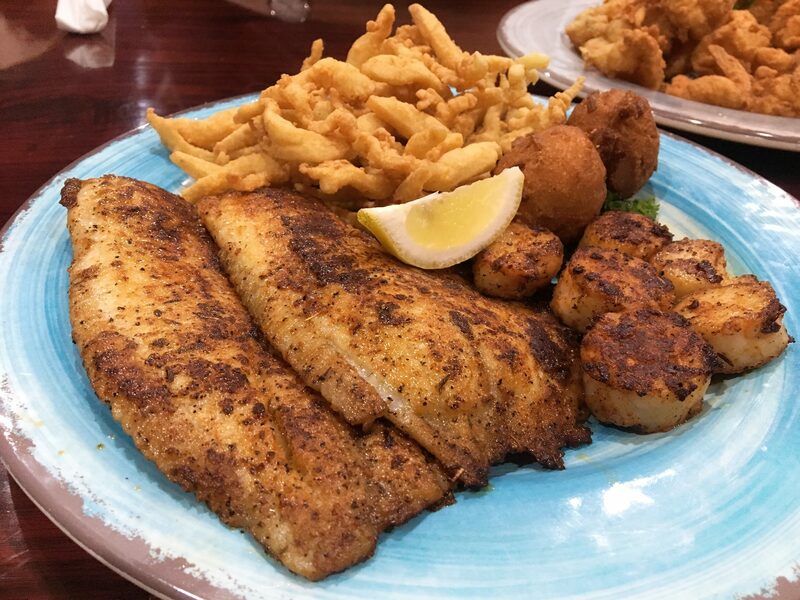 For the seafood trio, we picked the clam strips, blackened fish and blackened scallops. The clam strips were typical traditional fried clam strips. The blackened fish was a flaky white fish cooked throughout, flaky and not overcooked. If you love blackened seafood, you will enjoy this or the small scallops. For our two sides, we ordered a traditional coleslaw and thick cut green beans with slices of onion. The shrimp dinner was the highlight of the entrees. The large fried butterfly shrimp were piled high on the plate and served hot and fresh. You can also order shrimp as jumbo, baby, coconut and peel and eat. The shrimp were crispy on the outside with a thick meaty inside that was cooked to perfection and complete with the house made cocktail sauce. If you’re a fried shrimp lover, you will love this one. The show-stopper of the night was the slice of house made key lime pie ($3.95). If you love key lime pie and varieties of, you will love this. 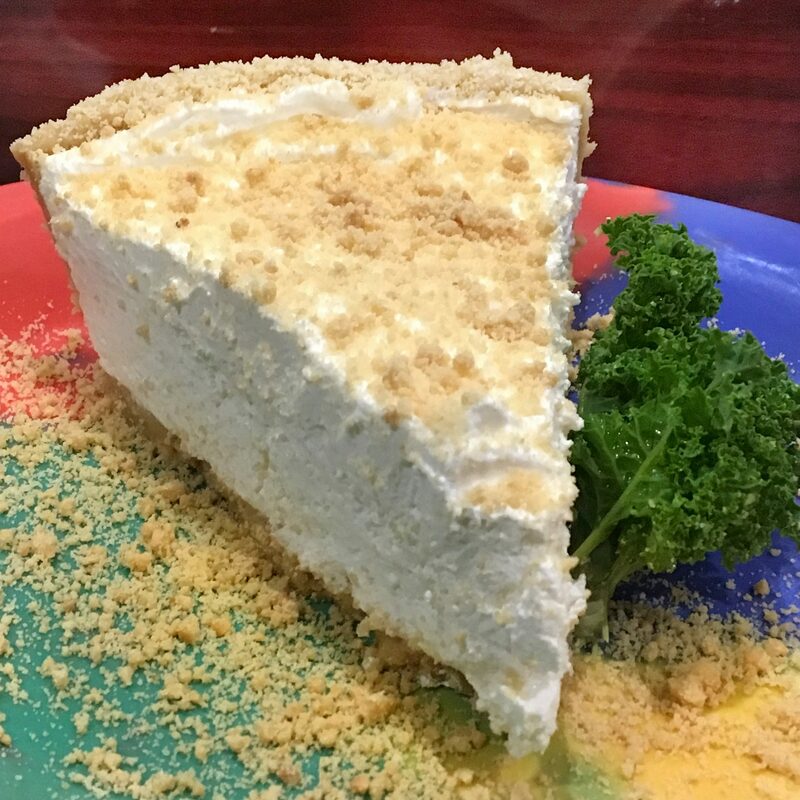 It was light and fluffy – more like a key lime flavored whipped crème pie on top of a very thin graham crust. The restaurant does offer other desserts too, however, the key lime pie was the perfect sweet treat to a seafood dinner. 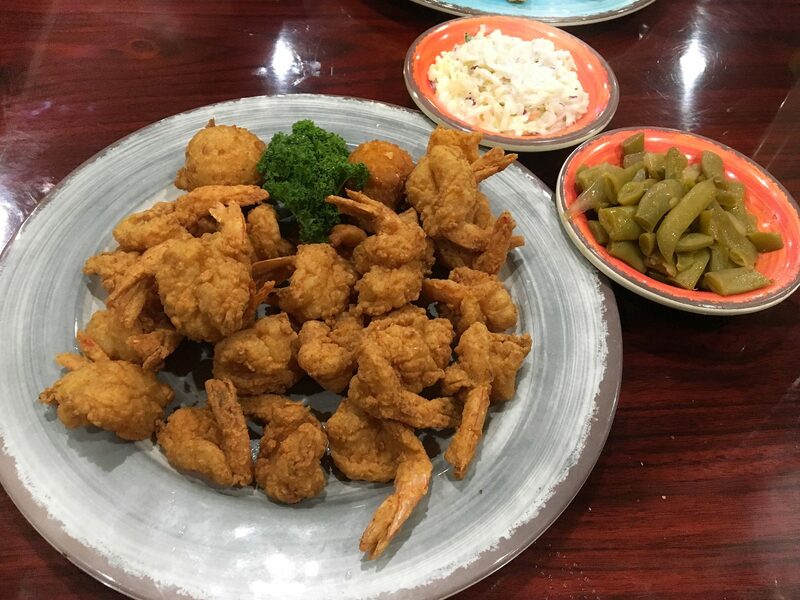 Bottom line, if you love casual, neighborhood, seafood restaurants that are a great value, quick and friendly, you will likely find Pirate’s Cove on your go-to list. 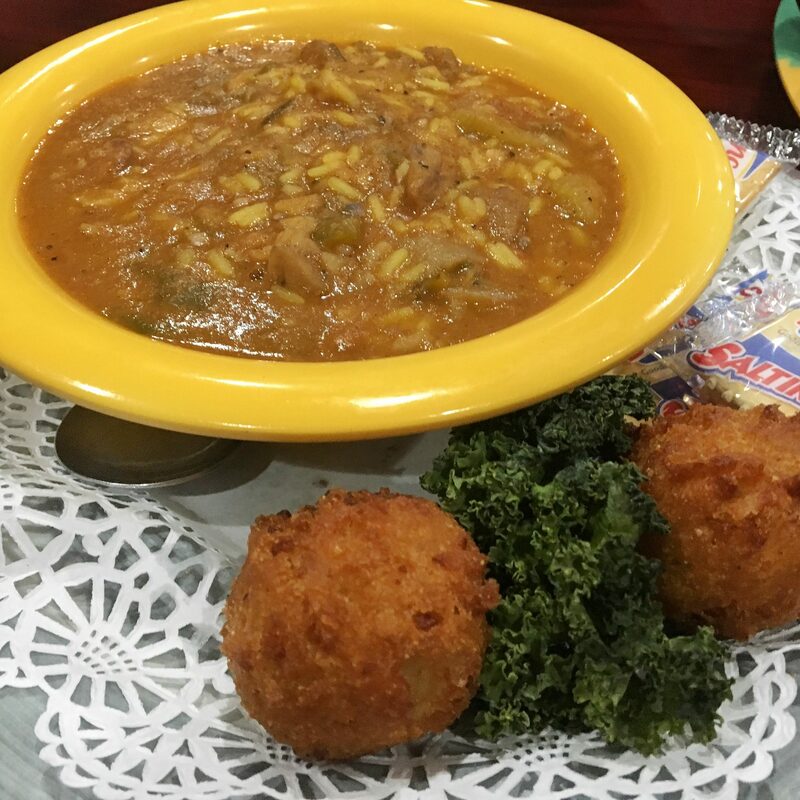 Although the appetizers were average and the blackened seafood and sides were nothing to brag home about, the gumbo, fried shrimp and key lime pie were winners all around the table. Tagged Beer and Wine, Casual, cheap eats, Dinner, good for families, Good for Kids, lunch, seafood, Takeout Available. Bookmark the permalink.